How Have Devastating Hurricanes Affected Rum? After one of the most destructive hurricane seasons on record, Caribbean rum producers may have to prepare for worse to come. The Spirits Business speaks to some of the biggest players in the region. 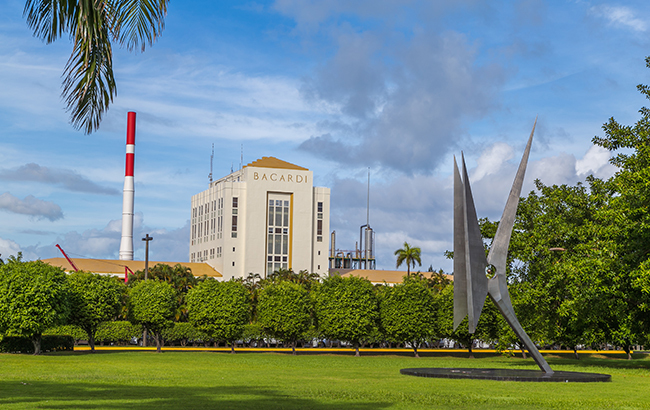 Puerto Rico is also home to Bacardi’s giant distillery on the north coast, opposite the capital of San Juan, where it produces 80% of all its rum. “The fact that we were up and running a week after the hurricanes passed through the island is a testament to the fact we were ready for them,” says Ignacio del Valle, Bacardi’s regional president for Latin America and Caribbean. As one of the first to arrive there after Irma, on a corporate humanitarian aid flight, he found the biggest challenge was logistics, from the lack of power to finding fuel for employees so they could get to and from work. The distillery itself was unscathed but for the odd smashed window and toppled palm tree, and there was no damage to stocks. “Incredibly, we didn’t lose a single barrel,” he said. Asked if this year’s freak conditions might become the norm, del Valle answers: “I don’t know if I can predict the weather patterns in the future, but we do have contingency plans in all our plants, whether it’s for hurricanes, earthquakes or floods.” Like many rum producers, including Diageo and Beam Suntory, Bacardi has given generously to disaster relief, donating US$3 million in the wake of Irma and Maria. In Puerto Rico, Bacardi’s swift return to production “sent a message to other industries to get back on their feet”, claims del Valle.